Data from the 2009 American Housing Survey (AHS) offer proof. The AHS classifies new construction as homes no more than four years old. This entry was posted on Wednesday, April 4th, 2012 at 12:53 pm and is filed under Data, Policy. You can follow any responses to this entry through the RSS 2.0 feed. You can leave a response, or trackback from your own site. 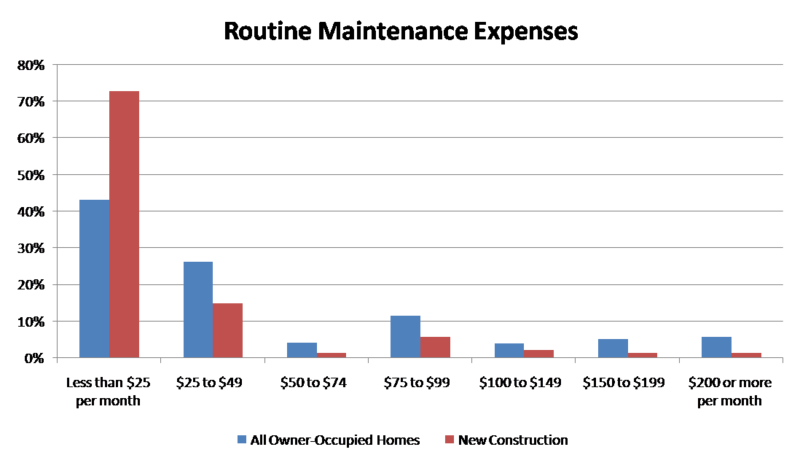 A great look at new home expenses in terms of maintenance! Great article! We will be sure to share this with our potential buyers. excellent information, we’ve been preaching this for years; great to have third party confirmation. In addition to the maintenance and utilities being lower, most insurance companies give a large discount for newer construction. The chances of a loss from pipe burst or electrical fire is less. In addition to lower maintenance and utility costs, the homeowners insurance is is usually discounted for newer homes! Hello, I too have the same opinion, new homes are less expensive to maintain as they are newly built and all the accessories and equipments are brand new. One more advantage of new homes is that home warranties are offered by manufacturers and it is a profit part for a buyer.